We’ve seen and featured some awesome light painting projects so far. But Josh Sheldon has taken light painting to a whole new level. He has combined a camera rig with 3D animation software. So, with some light and long exposures, he creates trippy 3D animations painted with light. When push comes to shove, the kinds of DIY solutions people come up with to solve photography and filmmaking problems really can be amazing. Take camera rigs, for example. DSLRs aren’t exactly the most ergonomic of devices when it comes to shooting video. But camera rigs can be very expensive, even relatively modest ones. So what can you do? For Ghana-based filmmaker Abass Safian, the answer was obvious. Make his own. And that’s exactly what he did with a few pieces of wood, some basic tools, and a little time. It’s a great looking DIY rig and probably does the job as well as some of the commercial options. 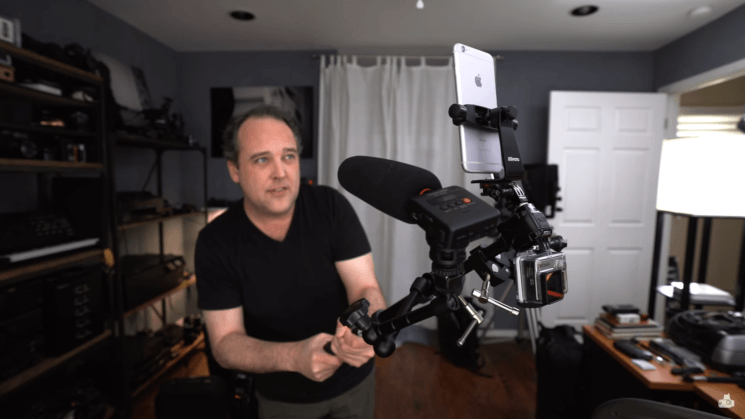 If you shoot video with DSLR or mirrorless cameras and you want to get serious, you really should consider a shoulder rig. They basically turn your camera from being Bruce Banner into The Hulk. You get so much more stability, capability and control. They’re more versatile and dynamic than a tripod or even a monopod. But they’re also often expensive. Filmmaker, Tom Antos put together his own DIY rig to turn his Sony A6500 into the perfect shoulder mounted camera. As well as giving you the steadiness and manoeuvrability of a much larger camera, they also help to overcome the shortcomings of smaller DSLR and mirrorless cameras. Like, decent quality audio, lighting, larger screens and battery life. Vlogging has seen a massive boom over the last couple of years. But, there still aren’t really any perfect options out there when it comes to the gear used and how to set it up. Everything seems to have a compromise. You get touch screen, but no 4K. 4K but no touch screen. Or you get both, but the AF can’t keep up. Or you get everything you want, but you can’t see the camera’s LCD and have no idea how your framing is. There’s all kinds of different workarounds out there to make life a little easier. Some options, though, aren’t quite as versatile as others. Switching from a mounted camera to handheld (or vice versa) can be a pain. In this video from DSLR Video Shooter, Caleb Pike shows us how to build out own vlogging rig that can be easily adapted to almost any setup. Whether on Youtube or elsewhere, we’ve all seen the overhead camera shot. While it might seem fairly straightforward, the process is actually quite a doozy to set up, especially if you want to ensure you have proper and even lighting. Photographer Jim Winters is shooting lots of aviation. As the way of Aviation photography, the camera/lens combo can be quite a heavy lift, and not easy to ballance. Some photographers use a lens collar or dual camera/lens bracket as a mounting point on a tripod, and while this setup is good for stabilizing the camera, is anything but portable. Jim Winters came up with the perfect (pink solution) he built a triple axis rig which mounts both the camera, heavy/long lenses and a plethora of other goodies. He named it the TRIAXEZ.